Amalfi and nearby Ravello on Amalfi Cost are located 4 hour drive from Rome with Pompeii conveniently located on the way to Amalfi Coast resorts. 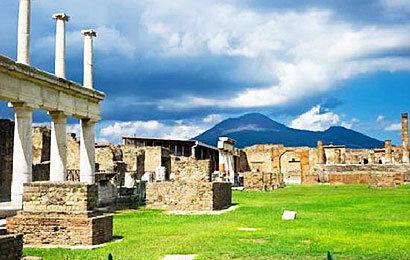 You will stop for a private two hour guided tour of top sites in Pompeii and then break for lunch. The drive from Rome to Pompeii will offer views of Appenine mountains dotted with hillside villages, followed by vistas of Mediterranean Sea of the Bay of Naples overshadoved by Vesuvius volcano. After Pompeii visit and spectacular drive along Amalfi Coast you will be dropped at the door of you hotel at the end of the trip.